Main Street in downtown Huntington is jammed every night — almost as much as Tum Thai Cuisine. 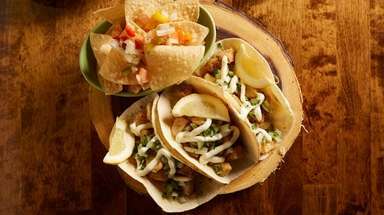 The immediately popular restaurant has a menu full of reasons for this — spicy, sweet, salty and always aromatic. In a bustling area with no shortage of Thai restaurants, it clearly stands out. That’s no surprise. 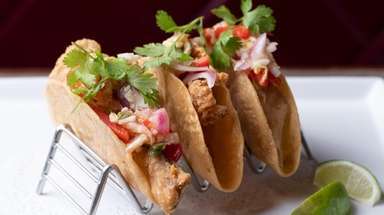 The openhanded newcomer is the easterly offspring of the equally recommended Tum Thai Cuisine in Rockville Centre. This branch opened in the cozy, compact space that was long occupied by Ariana, the Afghani and vegetarian restaurant. Now, the dining room is decorated with gold-leaf ceiling sculptures, crystal chandeliers, artful birdcages. That starts with delicate curry puffs filled with chicken, potato and onion; and a very satisfying chicken satay, boosted by a lush peanut sauce. Just as sharp: nua yang, or thin slices of barbecued beef finished with a chili-tamarind dressing. The Thai spring roll, crunchy and stuffed with clear noodles and vegetables, comes with plum sauce. 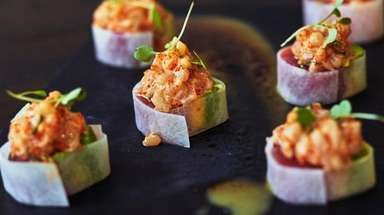 But it trails the duck roll, crisp-skinned with tender meat, neatly wrapped with cucumber, scallion and apple before it’s completed with hoisin sauce. Yum ped, or duck salad, gets a jump-start from chili paste, and unfolds enriched with cashews, pineapple, green apple and onion. Mee krob, a tangled tower of almost caramelized rice noodles, brings together shrimp, tofu and shallots before it’s finished with sweet-and-sour sauce. Contrast it with larb gai, an electric, invigorating salad of ground chicken with mint and cilantro. Nam sod, a ground pork salad with peanuts, mint and more in a chili-lime sauce, subtly heats things up and refreshes at the same time. Pan-fried vegetable dumplings, sparked with chives, improve on the standard pot stickers, here with chicken and sent out with tart ponzu sauce. Coconut chicken, fried breast meat with coconut flakes, shows up tender enough, but it’s too sweet. Chicken wings with chili-plum sauce have no such problem. 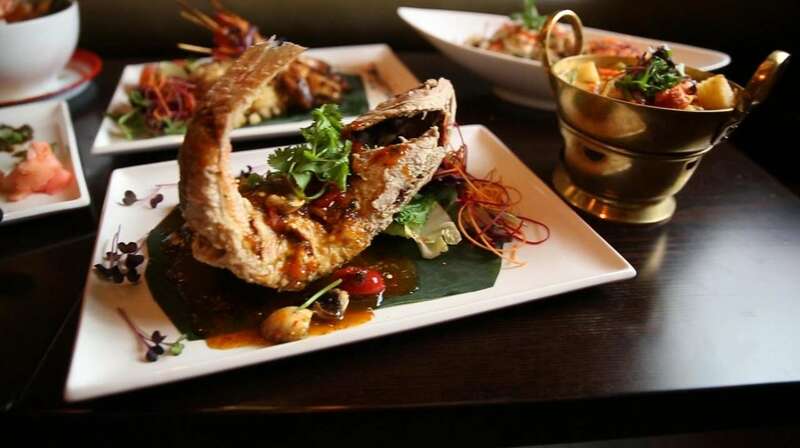 Tum Thai excels with pla lad prig, or deep-fried whole red snapper, a meaty, lean and mild swimmer accented with garlic, bell peppers and a spicy-tart sauce. A rush of Thai basil, with its hint of anise, spurs pla kra prow, also expertly fried and better with red snapper than the slimmer sea bass. 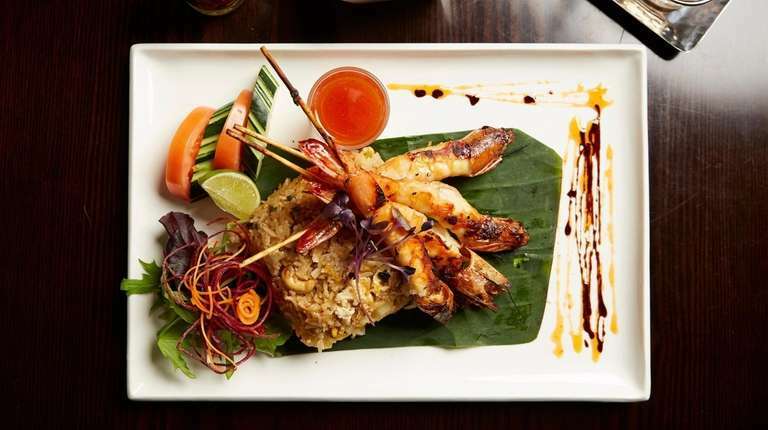 Siam shrimp are marinated, grilled and presented as if at attention atop pineapple fried rice. 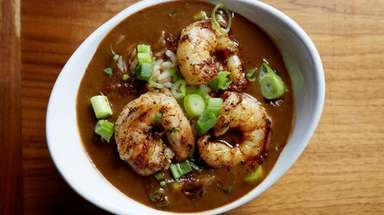 Consider shrimp with sauteed ginger, or with either tamarind or garlic sauce. Curries, from red to yellow, Panang to massaman, are flavor packed. The massaman curry with chicken balances tamarind with coconut milk and is generous with potatoes, peanuts, onion and bell pepper. Chili paste fuels Panang curry, which goes best with either shrimp or squid. Pineapple duck curry brings in tomato and lime leaves. 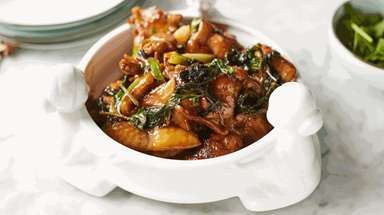 Duck with Thai basil in garlic sauce also heightens the heat, but doesn’t overdo it. Duck noodle soup with roasted duck, vermicelli and vegetables competes mildly. The soups that matter most, however, are classic tom yum goong, a spicy shrimp production laced with lemongrass and citrusy galangal; and tom kha gai, with chicken, mellowed with coconut milk. Noodles abound. Pad Thai, the familiar stir-fry with egg, peanuts, scallion and bean sprouts, finds the right company with either chicken or shrimp. Kao soi, egg noodles in a vibrant curry broth, calls for tofu or pork. One of Tum Thai Cuisine’s specials: crisp pork belly prig khing, rich, savory and prodded by chili paste and lime leaves. Though thin, the grilled pork chops marinated with lemongrass, honey and black pepper are moist and tasty, cantilevered on spicy basil fried rice. Desserts range from fried bananas with honey to green tea crème brûlée, before giving in to chocolate lava cake and fried ice cream. Tum Thai Cuisine keeps the concessions to a minimum, reason enough to earn a full house.